marriage | Are You Zhazha? When we told Nia we’d be celebrating our 10th wedding anniversary today, she accurately and adorably pointed out, “Your marriage is older than me!” Sure, it’s not as old as others but I still think our years have a lot of stories to tell. We were separated more than we were together during the first three years of our marriage but we made it work. I was a loner in Savannah while the Army had Andrew on months of training in California, an overseas mission in Kosovo and a war in Iraq. Even when we were at the same address, our job schedules kept us apart. He spoiled me by chauffeuring me 40+ miles for my weekend producing job, just so we could spend more time. The time apart in the military also meant we’d be apart for Nia’s birth. It was too much for both of us and Andrew decided a civilian life was best for our family life. I know that decision was so very difficult – I’ve always felt he was born to lead and he was such an awesome soldier – I am forever grateful. From Army Captain to Best Buy Sales Manager, career number two kept Andrew close to us but still wasn’t ideal for him or us. Career number three was. So much so, baby number two came into our lives. Nate’s birth was so special for both of us because we got to experience it together. We didn’t find out what we were having. We both wanted it that way. (We found out with Nia because we wanted to make sure he knew while at war – just in case.) Nate’s birth had complications and an emergency c-section was necessary. Andrew didn’t waver and I will never forget the moment we shared when the doctor told us everything was ok and that we were having a boy. After only a few weeks of unemployment, we both found great jobs (career four for Andrew, two for me) but it meant a big adjustment to our family. Nate would now need to go to daycare again. Nia would need to go to after school. We conquered this together and continue to work hard at it. There are so many other challenges and adventures we’ve experienced together but through it all we’ve taught each other so much. How to take better care of one another. How to be a team. How to best deal with my paranoia and worrying issues. How to not fight because there are crumbs on the counter, empty cups around the house or other quirks. How to try to be a parent. I know the coming years are going to continue to try us and to teach us. With Andrew as my partner, best friend, favorite and love, I can’t wait. Besides, I figure he’s stuck with me for another five or six decades. Then, we’ll really be older than Nia. 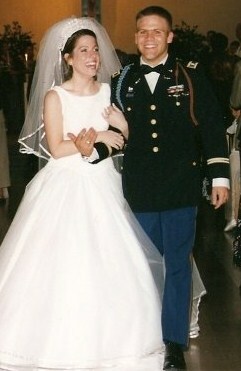 In a little less than a month, Andrew and I will celebrate our 10th wedding anniversary. I couldn’t ask for a better partner/roomie to grow old and put up with. When things get challenging, nerves are tried and the quirks add up, I will remind him that the receipt is thrown away and he can’t return/exchange me. You pile your dirty socks near the side of the bed. I never put clean clothes away. I am a moody girl. You check my birth control pills to see if there’s a valid reason for it. You snore. I don’t hear it when I’m sleeping. When I’m watching tv though, watch for a pillow to be thrown. You leave crumbs on the counter. I park too close to your work bench. I ask flighty questions and have many brain fart moments. (For example, not getting simple jokes or taking a few seconds longer than I should to figure out what word was just spelled to me.) After you look at me in shock for a minute, you don’t make me feel dumb, you make me feel endearing. You bring me home flowers when you go to the store each week. I bring you home my car that needs filled with gas. I let cups collect on my bathroom sink. You build cup towers with them. You love me. I love you back. Swoon.